252/365. 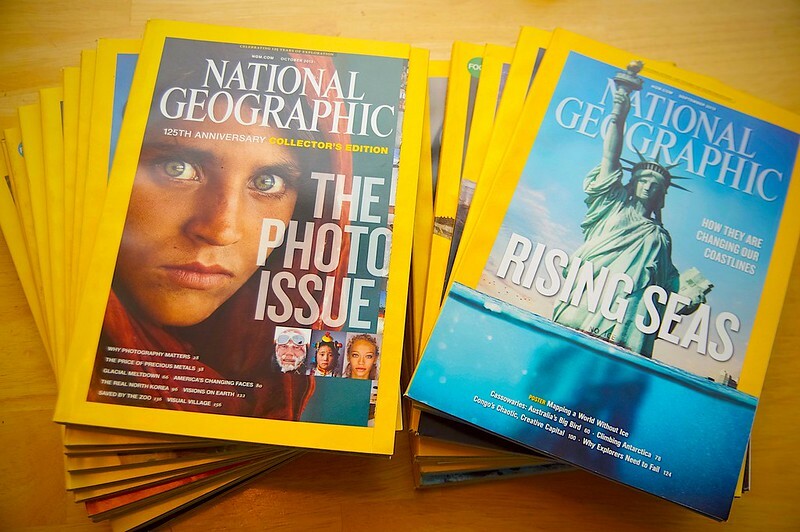 the end of a very long love of national geographic. i have a very strong nostalgic streak for national geographic magazine that stems, in part, from growing up in maine and perusing the large collection we had at our house. 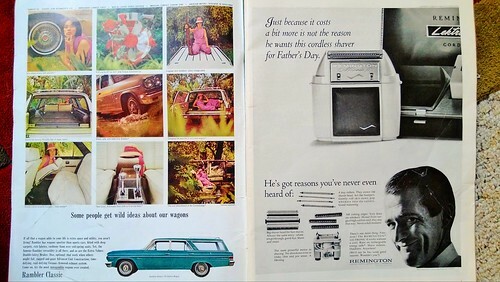 this was waaaaaaaaay before the internet and the magazine brought the world to our home. the mix of stories and powerful photography had a profound effect on me. i remember when the afghan girl issue came out and i stared at that cover with her haunting eyes for a long, long time. i have no doubt that the magazine planted the seed for my own love of taking pictures and telling stories. in a parallel universe very close to our own, i am probably a national geographic photographer. now older and with a family, we’ve had a subscription to the magazine for years. and while we’ve all ( odin included ) enjoyed many of the issues, as the years have gone by it was hard to not feel like it was slipping. i couldn’t always quite put my finger on what was changing. at times i’d notice a creeping corporatism in the stories and it felt like it was losing it’s uniqueness. increasingly issues would be left unread. last month we let our subscription lapse and i had been debating whether or not to resubscribe. this week it was announced that climate change denier rupert murdoch bought the magazine which i guess shouldn’t come as a surprise since his media company founded the national geographic cable channel in 1997 ( surely not a coincidence the channel is airing bill o’reilly documentaries ). the news spurred me to look into what had been happening with the magazine and i ran across an article written a few years ago by a longtime staff writer and editor for the magazine aptly titled ”what happened to national geographic?” that confirmed what we couldn’t quite articulate that led to our letting the subscription lapse. any suggestions for print pubs that fill the gap left by the magazine will be greatly appreciated. the new issue of cook’s illustrated ( love the magazine ) arrived and i’m amused to see we have both their highly recommended ( love it! ) 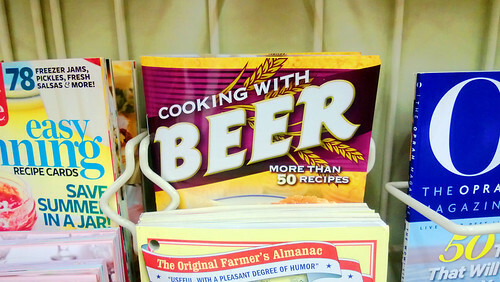 and not recommended ( hate it! ) 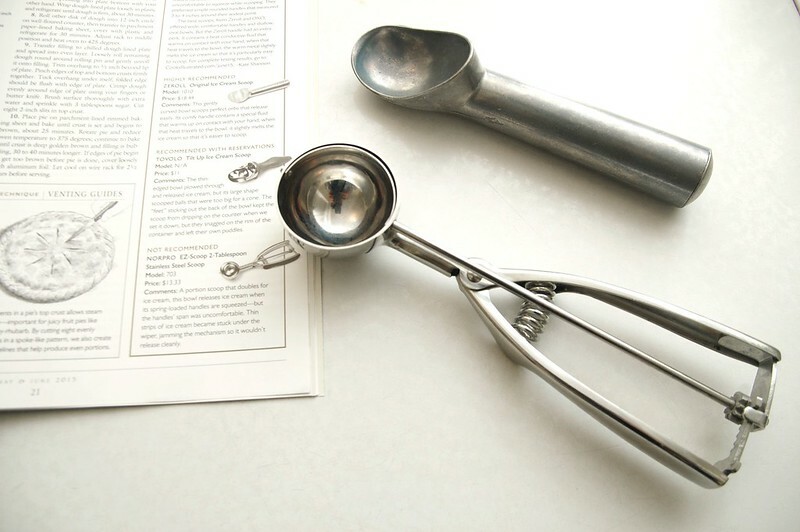 ice cream scoops in our house. 54/365. the art of the long view. 73 years ago j.i. 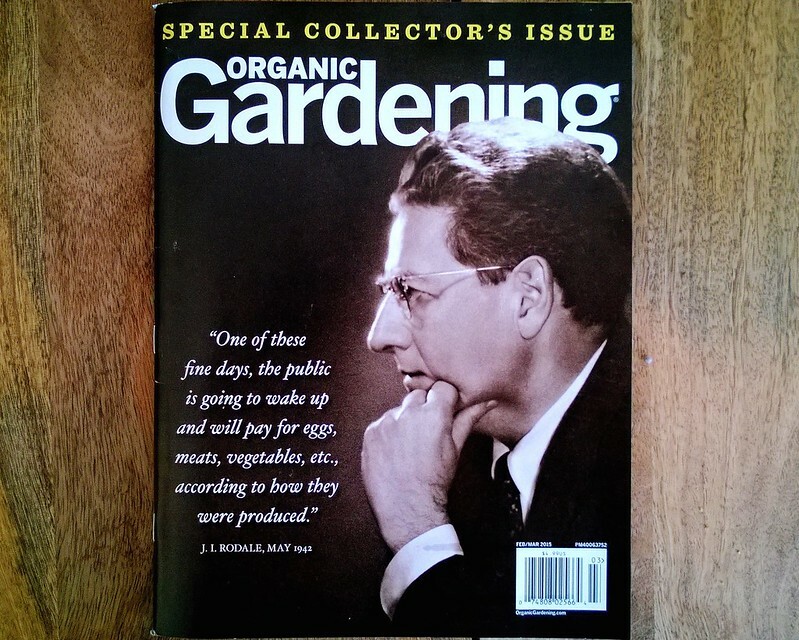 rodale had a vision. 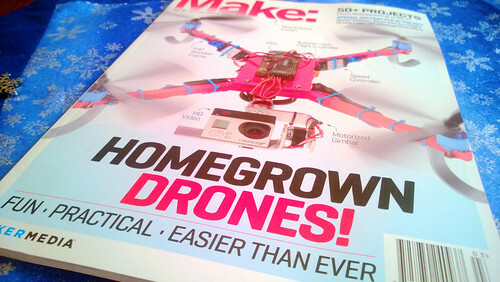 the new make magazine is going to keep odin and me busy for awhile. we’re still working on the kite aerial photography rig but having a aerial photography set-up that didn’t depend on a windy day that wasn’t also threatening stormy weather would be awesome. contemplating the gazes of zeldman, meyer and a goat. so i’ve got this an even apart lunch box on my desk at organic valley for no other reason than i’m a big fan of two folks on the box, jeffrey zeldman and eric meyer. i personally don’t have have much to with website design in my day job as the organic valley milk and cream brand manager ( though having a long running website i do like keeping track of what’s happening in the industry ) and thusly can’t convince ov to foot the bill to send me to the an even apart conference. but our interactive marketing manager did go to a recent conference, and when she learned i’ve always wanted one – she gave me the lunch box for nothing other than the promise of some purple moon ice cream. 100% completely excellent exchange. i was going to give it to odin so he could have a cool lunch box but , uuhhhhhh, it’s still sitting on my desk because i’m a bad dad and not so ready to part with the lunchbox. 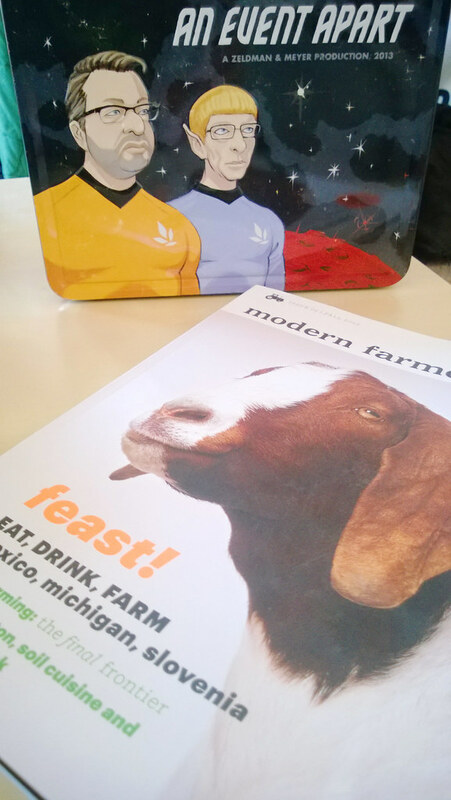 which is all a rather long explanation for how the goat issue of modern farmer ( excellent new publication by the way ) ended up on my desk next to an event apart lunch box. maybe i’m a little punchy, but look back and forth quickly at the gazes of zeldman and meyer on the lunch box and gaze of the goat on the cover of the magazine. makes me laugh. every. single. time. the ads are awesome and in some ways more interesting than the 16 pages of color space walk photos from the gemini 4 mission.